Here's how to visually make the most of your space. Residing in big cities usually means dealing with small spaces—especially when it comes to the living room. 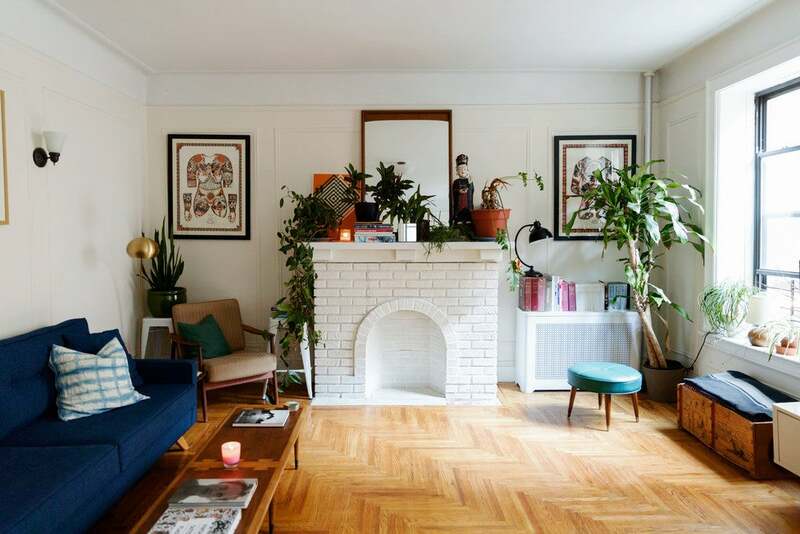 Though you may think you’ve figured out the best hacks for your tiny apartment, chances are, you’re breaking at least one cardinal rule of small space decorating… but don’t worry, because we’re here to help. If you’re allowed to paint your apartment (some landlords are out to squash your design dreams with strict leases), do it: A fresh coat of paint not only makes the space feel clean, but if done right, can also make a room feel bigger. When we asked a few of our fave designers about their favorite size-multiplying paint colors, the overwhelming response was white. A suggestion? Choose a crisp, simple shade like Benjamin Moore’s “Simply White.” And for a bit more color that won’t make your living room feel tiny, designers also love painting walls gray, blue, and even of-the-moment lavender. While a layered scheme of colors and patterns may look great, in small spaces, they can run the risk of clashing and making a room feel cluttered. Opt for a dominating color scheme and apply it to the majority of the accent pieces and furnishings to keep the look unified, like in this pinkwashed corner. Be sure you’re taking full advantage of every corner! Install shelving units higher up on the walls to make the ceilings appear taller or mount your TV to the wall to free up floor space below. There are myriad ways to utilize walls effectively. We’re not suggesting you forgo accessories altogether, just cut back. Break up an over-decorated bookshelf with a few more minimalist-inspired shelves or keep the coffee table decor to a minimum. Or, if you have a bold rug like this living area, keep the furniture and backdrop a crisp white. If you’re lucky enough to have natural light in a room, don’t minimize its effectiveness by overpowering the windows with heavy drapes. Stick to sheer fabrics in soft tones, to ensure your living room is maximizing on its sources of natural light. It’s a decorating cliché for a reason: light colors like this grayscale room really do make a space feel bigger. Dark colors definitely bring the drama and add a unique edge to a room, but they also make a small space look even more compact. If you really want to incorporate darker tones, make sure the larger areas of the room—walls, floors, and large pieces of furniture—are lighter-hued for a healthy contrast. Oversized mirrors open up a room by adding depth and reflecting light, which is key if your living room is lacking either. Full-length mirrors can be quite expensive but you can easily slash the price by hunting for vintage finds at your local thrift shop. Alternatively, placing a bunch of smaller mirrors together will have the same effect as a bigger one while also doubling as a statement. You’ve heard it a million times, but it’s true. Rug placement visually changes everything. If your furniture is positioned against the wall, make sure the rug is halfway under all your furniture (this means back legs off, front legs on). When dealing with a super small space, buy a rug that can be centered and solely under the coffee table. Don’t necessarily buy the biggest size that can fit in your space. Creating a more inviting space with less seating, or mixed seating with a smaller couch, will be better. Incorporating chairs, poufs, and ottomans into your space for additional seating is great for entertaining larger groups without adding bulkiness. Don’t have room for a coffee table? Don’t force it. Side tables can be just as effective. Look to shelving for more storage and added decoration. If you really have no room for ANY table, put a thin console behind your sofa. Settling on a layout is difficult, because most times it’s a high traffic area that’s in the center of your home or apartment. The number one mistake people make is shoving all of their furniture against the walls, creating a cluttered, full-but-empty effect. Don’t be afraid to float your furniture in unlikely places and contemplate different chair, sofa, table, and tv combinations. On the other hand, it depends on your style. If you are the furthest thing from a minimalist, don’t be afraid to accessorize in a big way. Filling walls, shelves, and tables with items you love will automatically make the space inviting, cozy, and personal. Just make sure not to mistake clutter for accessories; be organized and intentional with what you choose to hang and place. Credenzas are cool, but if you don’t have a sleek, modern-designed stand, ditch your clunky storage stand for something more slim and open. Display chic items instead of stuffing away those cords, old DVDs, and unsightly “I have nowhere else to put these” things. Store your stuff in an ottoman or coffee table that opens up with storage. If you don’t have the budget to splurge on a cool, multifunctional item like you see here, figure out what you can make multifunctional without spending any money. Use your TV stand as a dresser (yep, a small space reality) or even opt to use your coffee table as a dining room table if you’re really tight on space. Looking at beautiful photos for inspiration is easy, but really looking at your space and working hard to discover items that would really work well is important. Don’t do what will take the least amount of time or is most convenient, do what will give your tiny living room the most life. This story was originally published February 23, 2017. It has been updated with new information.